Before driving through a tunnel, what should you do? Before driving through a tunnel, what should you do? This is a scenario that will happen occasionally: you are driving along and suddenly, for some reason you can’t see out of the windscreen. There are things you can do to alleviate this inevitable problem. Occasionally other drivers will forget to turn their headlights from high beam to low beam. 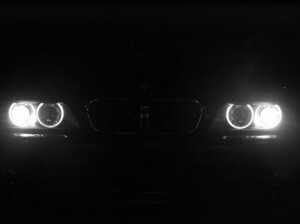 You can give them a quick flash of your headlights, but if they don’t respond, do not try to blind them by putting yours on high beam as this just makes two of you now driving blind. Instead, focus your vision on the left hand verge and judge your distance until the other vehicle has passed. If the driver is behind you, you will be able to dip your mirror so it’s not as bright. Remember, if you try to wash your windscreen while you have sun strike it will temporarily make it worse. Also, it’s good to know which side your windscreen washers are on because if you pull back the stalk on the wrong side you’ll just high beam oncoming traffic. There are certain buildings and vehicles that will temporarily reflect sun into your eyes. Sunglasses and the sun visor may help, but if not, use the same technique as with the high beam headlights: focus on a part of the road where you are not being blinded and judge your distance using that. At certain temperatures and humidities the inside of your windscreen will fog up. This is because of the difference in outside temperature (cold) and your introduced humidity through breathing and sweating causes condensation on the inside of the windows. Keep your windscreen clean on the inside. Condensation readily forms around dust particles, so the cleaner the screen, the slower the window is to fog up. There are commercial anti-fogging products you can apply to the inside of your windows if you live in an area where this is a common problem. Use your windscreen demister to blow hot air on the windscreen and clear it. The rear window will also have a demist function. Make sure you know how to quickly adjust your air conditioning to get this working. 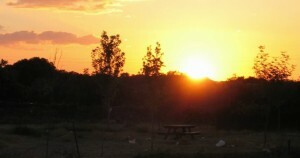 Turn your air conditioning on to make it faster because this dries the air. You should also carry a cloth to wipe the windscreen with in case your engine is not sufficiently warm to evaporate the condensation. 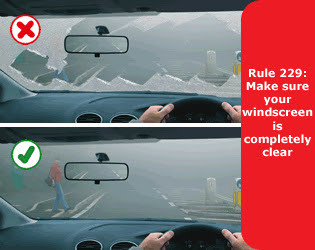 Rule 229 of the Highway Code says that you must clear your windscreen properly of ice and any fogging, as well as clearing your mirrors and making sure your lights are clean. 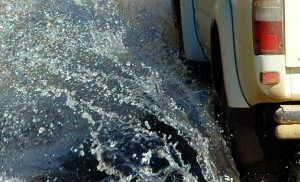 Deep residual puddles after the rest of the road has dried can cause an unexpected shower of water to hit your windscreen. You have to learn to anticipate these and react to them with full speed windscreen wipers. Watching the road ahead and anticipating these scenarios is something you get better at over time. Muddy and/or salty spray (especially from large vehicles) can also be problematic. Be cautious when following a vehicle that is kicking up a lot of spray because it could prevent you from seeing far enough ahead to overtake it safely. There are special windscreen coatings that can be applied which repel rain and dirt, and reduce fogging. All modern bonnets have a two-stage latch so if the first stage fails, it catches the bonnet and prevents it from flying up and hitting the windscreen. I have had the bonnet fail one stage once in my 23 years of driving, and never the second stage, although, it does occasionally happen. If, by some remote chance, your bonnet does fly up, air pressure will cause it to stay pressed against your windscreen (which will probably suffer considerable cracking if it’s not smashed completely). Your only remedy is to look out your window, don’t panic brake, but brake reasonably hard to bring the car to a stop safely without causing an accident with cars following you. You will be able to judge where the edge of the road is by judging how far you are from the centre line of the road. If you are on a motorway, then you’ll see the hard shoulder. Braking time and distance is the important factor here. If you were paying attention to the road you will already know what’s coming up for the next 100-200m or more (unless the road is very windy), so you’ll have an idea of where to steer. If the road has no markings then you’ll need to judge your manoeuvre by looking out of the passenger window and trying to feel when you are on the edge of the road. You are temporarily blinded while you sneeze because we all close our eyes when we sneeze. One sneeze won’t make much difference, but if you have a sneezing fit you will put yourself in danger because you could end up travelling a considerable distance while your eyes are being repetitively opened and closed for up to a second at a time. Changing light levels due to tunnels, shading, bright sunshine, headlights and so on is a real challenge for older drivers as their eyes take longer to adjust to the new light levels. 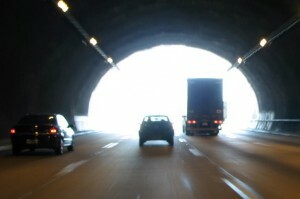 If you are driving from bright sunlight into an unlit tunnel, make sure you take your sunglasses off. You can turn your lights on to help you see during that initial phase where your eyes are adjusting. When you come out of the other side of the tunnel you might be blinded by the sun and your eyes will need to adjust again. Motorcyclists can be blinded by a stone smashing the visor. Visors can also fog up, get dirty and become scratched (all of which exacerbate the effect of sun strike). Readers – can you think of any other scenarios where you are temporarily blinded while driving? Let us know in the comments section below.